Are you preparing your Sunday menu for friends and family or simply planning to relax with your family and watch a movie tonight? Don’t forget Melina’s favorite cheese pie. It’s so easy to make and she loves it so much that she made it again. Here’s a new photo of the pie and a reminder for the recipe. Don’t forget the pie needs to stay in the fridge for a few hours before you cook it. Other than that it’ll only take you 20 minutes to put it together. Enjoy! How to make: Crumble the feta cheese in a bowl and set aside. Beat the eggs lightly, mix them with the milk and set aside. Brush the bottom of a pan with oil. 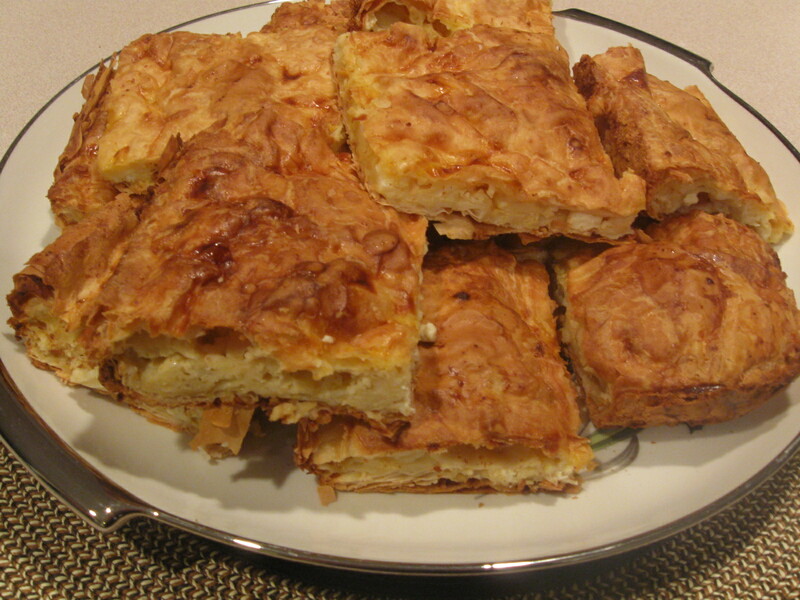 Take a phyllo sheet and lay it on the bottom. Fold in the corners of the phyllo sheet if you’re using a round pan or a pan smaller than the sheets. Brush with a little oil, especially at the edges. You don’t need to use too much oil. Just a little bit. Repeat with a second layer. Then sprinkle a little cheese here and there, not too much. Repeat (spreading feta cheese every two sheets) until there’s about 4 sheets left. Lay the last 4 sheets on top but this time be sure to fold the corners under themselves so the top looks good. Brush the top with oil. Pour in the egg and milk mix and shake the pan lightly so the mix penetrates the pie evenly. Cut the pie in pieces. Let it stand in the fridge for about 5 hours. Cook in medium hot oven until it’s nicely browned.